Not since Bruno Bettelheim's The Uses of Enchantment has there been such an illuminating contribution to the world of children's fairy tales. The Annotated Classic Fairy Tales is a remarkable treasure trove, a work that celebrates the best-loved tales of childhood and presents them through the vision of Maria Tatar, a leading authority in the field of folklore and children's literature. Into the woods with Little Red Riding Hood, up the beanstalk with Jack, and down through the depths of the ocean with the Little Mermaid, this volume takes us through many of the familiar paths of our folkloric heritage. Gathering together twenty-five of our most cherished fairy tales, including enduring classics like "Beauty and the Beast," "Jack and the Beanstalk," " ," and "Bluebead," Tatar expertly guides readers through the stories, exploring their historical origins, their cultural complexities, and their psychological effects. Offering new translations of the non-English stories by the likes of Hans Christian Andersen, Brothers Grimm, or Charles Perrault, Tatar captures the rhythms of oral storytelling and, with an extraordinary collection of over 300 often rare, mostly four-color paintings and drawings by celebrated illustrators such as Gustave Doré, George Cruikshank, and Maxfield Parrish, she expands our literary and visual sensibilities. As Tatar shows, few of us are aware of how profoundly fairy tales have influenced our culture. Disseminated across a wide variety of historical and contemporary media ranging from opera and drama to cinema and advertising, they constitute a vital part of our storytelling capital. What has kept them alive over the centuries is exactly what keeps life pulsing with vitality and variety: anxieties, fears, desires, romance, passion, and love. Up close and personal, fairy tales tell us about the quest for romance and riches, for power and privilege, and, most importantly, they show us a way out of the woods back to the safety and security of home. Challenging the notion that fairy tales should be read for their moral values and used to make good citizens of little children, Tatar demonstrates throughout how fairy tales can be seen as models for navigating reality, helping children to develop the wit and courage needed to survive in a world ruled by adults. This volume seeks to reclaim this powerful cultural legacy, presenting the stories that we all think we know while at the same time providing the historical contexts that unlock the mysteries of the tales. 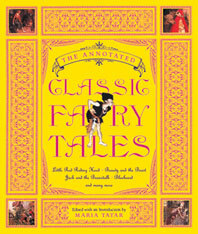 The Annotated Classic Fairy Tales is a volume that will rank as one of the finest fairy tale collections in many decades, a provocative and original work to be treasured by students, parents, and children.